The Dog, Jackie and I first noticed these Horsetails as a patch of different green, in a little corner between two fields and the beck. We don’t actually have access to the patch of marshy bog in question, but we have kept an eye on them from the bridge. To start with, it wasn’t that obvious from our distant observation point, what they were going to turn out to be. Today, as I idly leaned on the railing, I noticed that there was some type of flower developing on the plants, so I judged it time to take a photo. When I put the photo on the computer you could see straight away that we had been watching Horsetails. Then, I made the mistake of having a chat with Google about them. “Horsetails hybridise mercilessly,” he said, “it’s quite difficult to tell what is what, without pulling the plant apart.” Luckily, when I reach the red line of irritation and frustration with wild flowers, I have found a safety valve in Wild About Britain. The immensely soothing reply soon came back “It looks like Marsh Horsetail to me.” As always, it isn’t what you know, but who you know that counts. 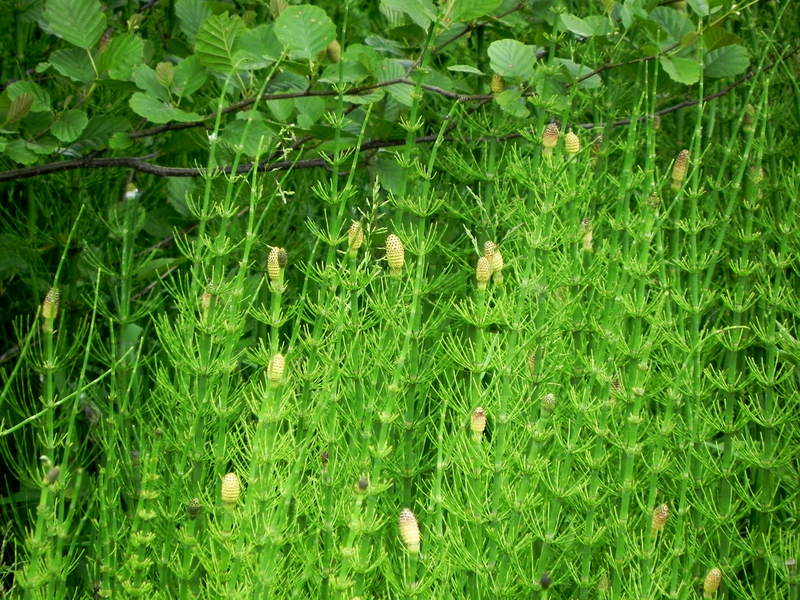 Horsetails have been around for more than four hundred million years. And here they are standing in the corner by the beck. Do you think the dinosaurs shouted “We’re just popping out to an extinction party. See you later!” perhaps? Sorry chaps, but I don’t think they’re coming back, but if you’re going to wait anyway, at least sit down. I think they’ll be a while yet.